We arrived at 10.30 and made the trip via train to Termini. It’s fast and efficient and costs about 12e each. Then a taxi to our hotel the Hotel Navona Via Dei Sediari. It’s a pleasant surprise. The room wasn’t ready so we left our bags and headed off. Piazza Navona was out first stop. How beautiful it is there with its playful fountains and people posing for photos. The weather is spectacular. Then it was to Via Coronari a favourite street of art , jewellery and glass shops before a siren sounded and people started gathering in a little Piazza. 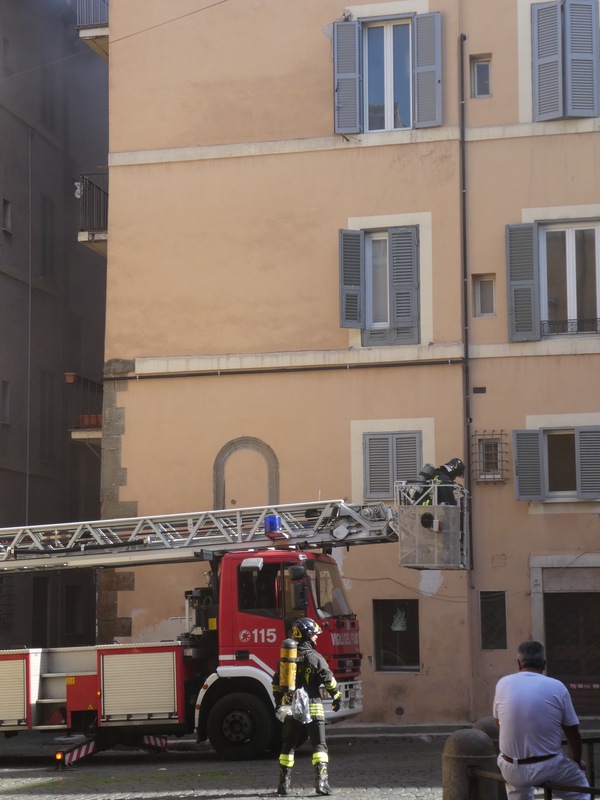 Smoke was streaming out of an upstairs window and people were pointing and exclaiming and a fire engine made its way along the narrow cobblestone Via. We stayed and watched the action. 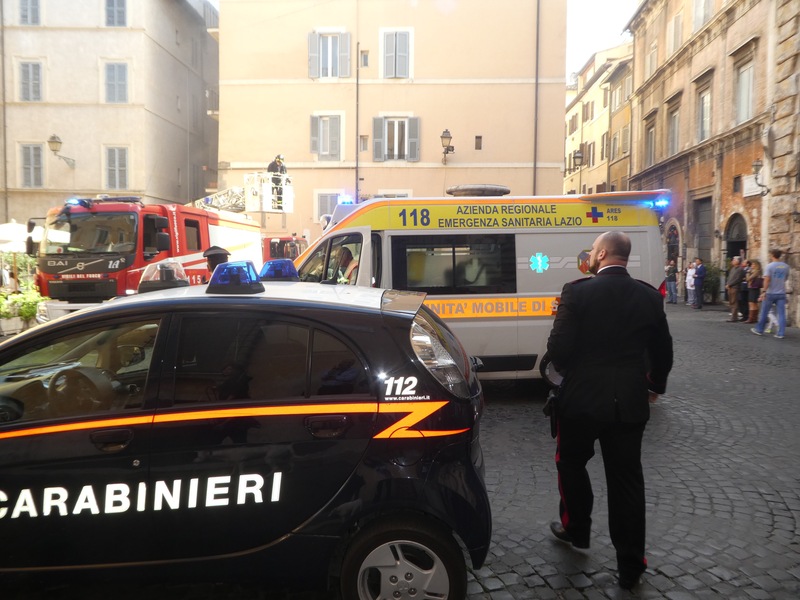 Police – the Carabinari arrived , two fire trucks and an ambulance. Then the crowd stood as one and smoked and chatted whilst waiting for some action. It took on a community feeling. But taking far too long. So we headed to cafe de Theatro. This little cafe sits in a lovely little Piazza and was buzzing. 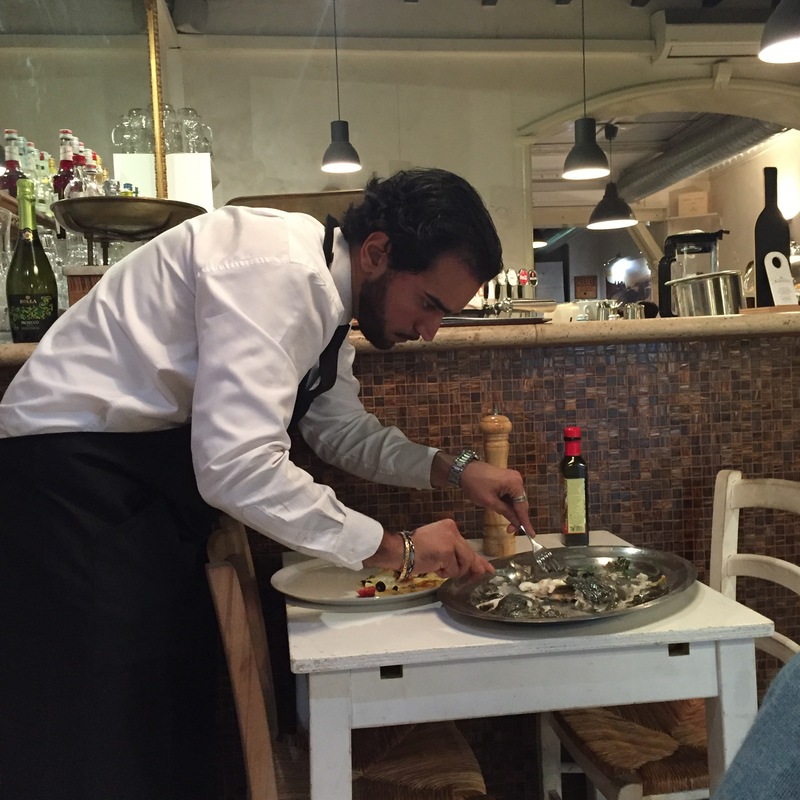 The waiter considered his job a performance so entertained the customers- to the amusement of some but definitely not all. The fire 🔥 spectacle had finished so it was safe to continue walking. What I love about wandering in Rome is that around every corner sits a surprise so wonderful it takes your breath away. 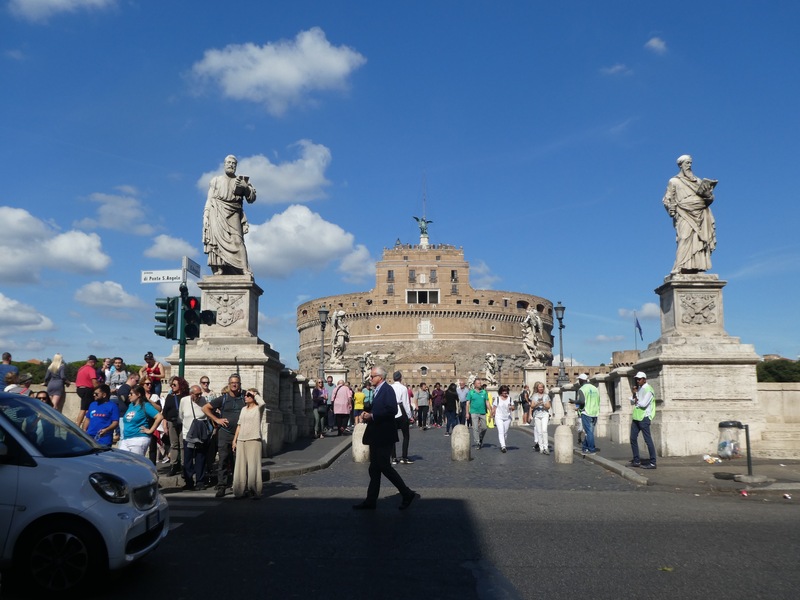 We rounded a corner and looked towards the river and there was Castello St Angelo. Such a beauty sitting with its history so imposing. I also love Paris but Rome has a different effect on me. It’s more casual about its place in history. It’s there for all to enjoy. Paris is more formal – very beautiful but more controlled. Rome and its people want you involved in having fun. 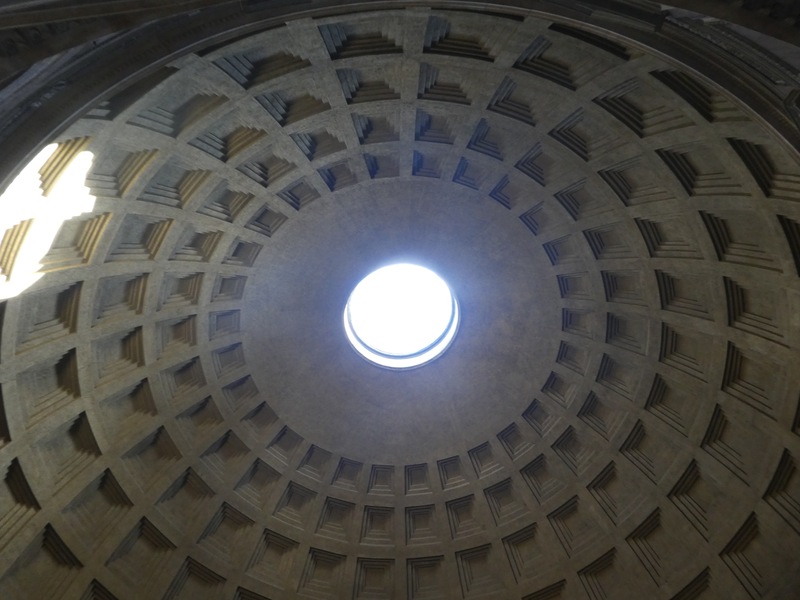 We had to return to possibly my favourite place – the Pantheon. I love the feeling it gives me. So we walked and observed the history and the people having fun. The business men looking impossibly glamorous with one hand in a pocket the other nursing a cigarette. With their navy suits and their tan shoes and such well fitting trousers! The women wear either ballet flats ( I bought a red pair) or heels as they manoeuvre the cobblestones with confidence. Also the scarf tied casually at the neck sets off any outfit. It’s a pity the hordes of tourists get in the way of this street fashion catwalk. Naturally we had a gelato. Apart from the tourists the locals also enjoy a gelato in the afternoon. We bought ours at that cathedral of gelato, Giotto – where the act of buying is a theatre. By now the crowds were out, the armed guards standing on most street corners and the Aperol Spritz drinkers taking up key positions in the sidewalk bars. We joined them at Piazza Popolo. Such a great way to people watch. .
Back to our room which turned into an apartment – lovely but turning on lights is like organising a Vivid Festival! Dinner was gorgeous. Baked fish served by Mr Rome. A young handsome man who in the olden days would have been a gladiator! I enjoyed a baked fish with potatoes sliced so fine you could see through them. A Sicilian dish. Steve had Veal lemoni a Roman tradition. A quiet walk back to our apartment where a tribe of young girls were yahooing in our hotel courtyard and clomping up and down the staircase. Rome in all its glory! We have the morning to wander before heading for the cruise ship in Civitavecchio. Oh Fran! You brought back memories from just a couple of weeks ago. We also had a drink in the Teatro piazza, visited Navona, Popolo, Pantheon and walked beside the Tiber. 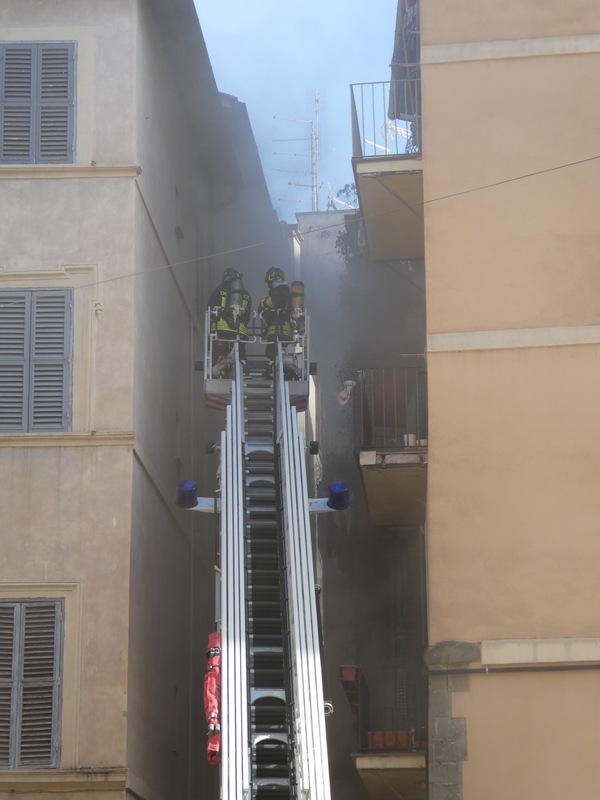 Last time, we even stayed in an apartment on Via Coronari!….so I share your sentiments and ‘walked’ with you too. Oh yes, I love Rome too. It is just as you say it Fran. Off tomorrow on my LA flight & then onto Seabourn ship. Loved your day Fran – fantastic! 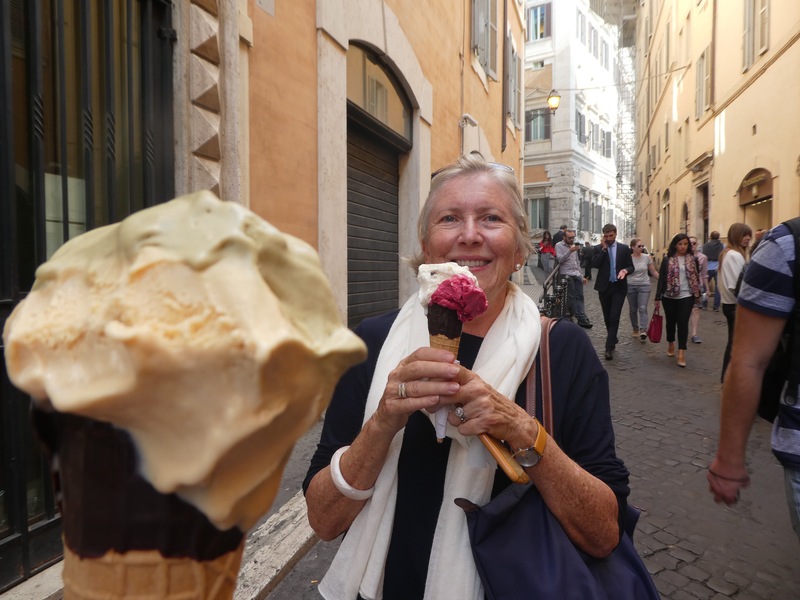 Fran – a wonderful account of a day in Rome ” in all its glory”. From your writing I can hear the you have for Italy. There is an extra bounce in your prose. Have a great time on your cruise! Love reading your blogs Fran, so descriptive and makes you want to be there too. Have a wonderful cruise and keep the writing coming.